This Indian apple chutney is sweet with a little heat! It’s a perfect and unique way to use up any extra apples this apple season. 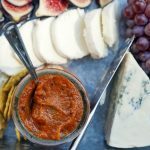 The best thing about this yummy bright red chutney is that it’s made in an Instant Pot, so it’s an easy, hands-off recipe! Recently, I found myself with several bags of apples waiting to be eaten. And by “found myself” I mean, I went to the store and bought 20 pounds of apples… Why? Because we had an apple-themed potluck at my house and I wanted to make sure we had enough apples. I made this delicious apple chutney, apple butter, chilled apple cider punch and a spiced apple pulao. I really love all of the apple recipes that I made, but I have to say this chutney was my favorite. It’s just so unique in flavor! It’s made with traditional Indian pickling spices like fennel seeds and fenugreek seeds. It also calls for curry leaves which not only adds aroma but also gives the chutney an extra flavor boost. Use it as a topping for your favorite protein (I suggest pork chops or grilled chicken, yum!). Serve it as an accompaniment to an Indian meal. 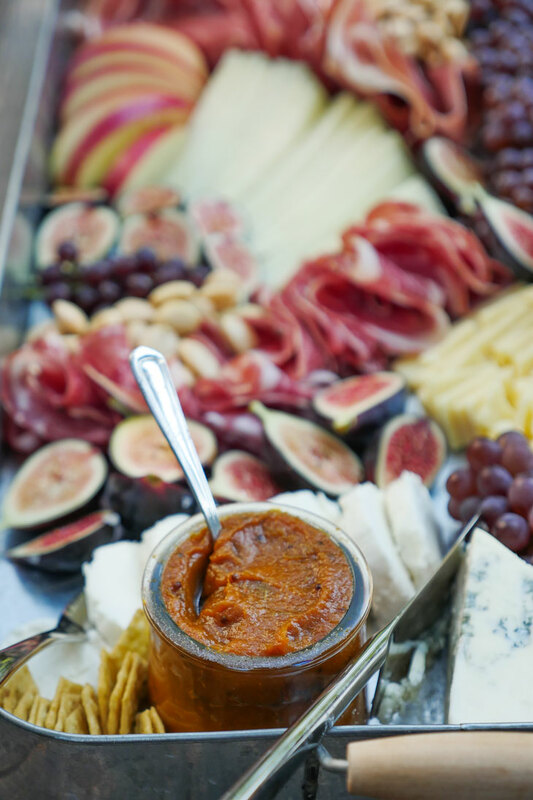 Put it on a cheese board and wow your guests! I put a small jar of this apple chutney on a fall cheese board and it was definitely a conversation starter. Putting this on a cheese plate is a great way to introduce an Indian recipe to friends who aren’t quite as familiar with Indian food. 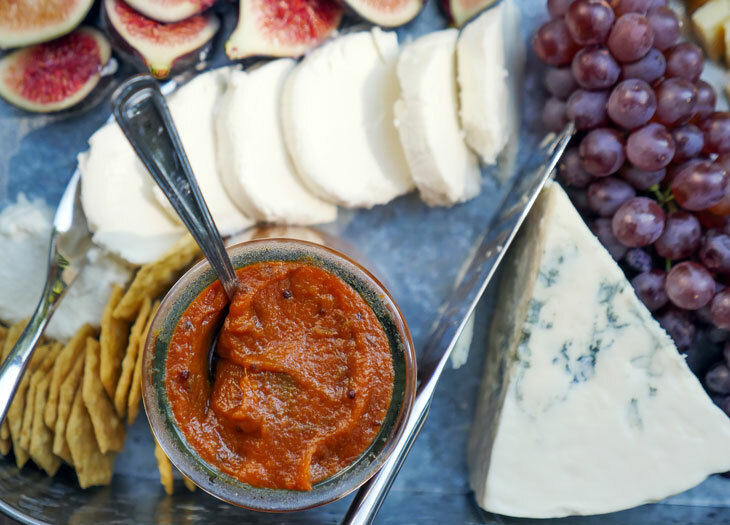 If you make this delicious fruit chutney, know that you will be giving your guests something to talk about while they snack on it. If you have an abundance of apples this apple season then you must try this instant pot apple chutney! You can even freeze this chutney to enjoy later in the season. Let me know if you make this! Press sauté, add oil and allow it a minute to heat up. Then add the cumin seeds, fennel seeds, fenugreek seeds, mustard seeds, curry leaves to the pot. Once the cumin seeds begin to brown, add the apples and remaining spices (turmeric, ginger powder, salt, cayenne). Give everything a good mix, then add the apple cider vinegar. Puree the contents of the pot with an immersion blender (or put everything into a blender and puree until smooth then put it back into the pot). Press saute and adjust to low, add the sugar and cook for 10 minutes, stirring occasionally, until the chutney thickens. Add Kashmiri chili or paprika if using and cook for another 1-2 minutes. Store in an airtight container in the fridge for up to a week or in the freezer for up to a month. Found this recipe just in time. Going to make it today. Ashley, I don’t see kindle edition of your book. Any plans to have an e-book soon? Thanks! Hi Lisa, let me know how the chutney turns out for you! I will have a kindle out in the next few weeks 🙂 I’ll save your email and let you know when it’s ready! Hi Ashley! Thank you so much for this recipe! My husband and I LOVED it! It paired so well with crackers, as a veg dip, and also with turkey sandwiches! I love the perfect blend of sweet and spicy! I’m definitely bookmarking this recipe for fall dinner parties and for holiday dinners! I’m making a second batch of this right now. Everbody loved it, and we bring it out for every meal! Argh! Could I make this without curry leaves by any chance? Yes, you can leave them out and it’ll still be good. I think curry leaves do add a great flavor so maybe try it with them next time! I made this and it’s just terrific. With the shortened cooking time of the Insta Pot makes it even better. Do you happen to have a recipe for apple jam? Hoping to make some for kids without any spices. Thanks. Can I make this on the stove top? I don’t have an instant pot.